In 2002, Atelier Incurve was founded as an art studio of Social Welfare Foundation SOOHKAI. It provides a beneficial environment for artists with intellectual impairment, and supports their activities to establish themselves in the art world. Presently, there are 25 artists. In 2005, their artworks were first introduced at an art fair in New York. Since then, their artworks have been frequently displayed at many museums and galleries both in its home country Japan and abroad. 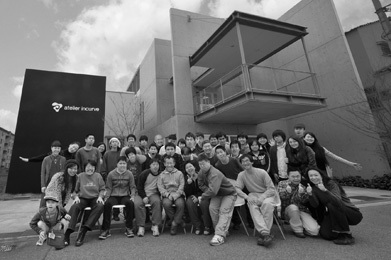 In 2010, Gallery Incurve Kyoto was established focusing on the artists of Atelier Incurve. It has actively participated in contemporary art fairs overseas such as New York and Singapore as well as in Japan. Biblio Incurve is a publisher that brings out books, art books, and DVDs expanding concept of welfare for the impaired. It also designs, produces, and sells original goods based on art works of Atelier Incurve’s artists.